Whereas potential value is the capacity of a final output to increase health, effectual value is the actual health gained from the output’s consumption — that is, its assimilation and use. The role of effectual value in ENL is to judge the distribution and consumption of final outputs. Like potential value, effectual value can initially be positive or negative. Unlike potential value, it tends to decrease at the margin. Thus, effectual value that is initially positive may become negative as consumption proceeds. 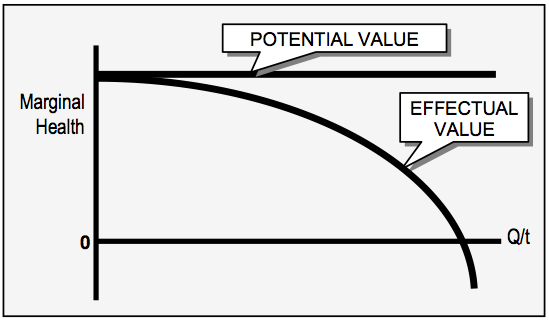 A typical effectual value curve is shown in the following figure. Effectual value is the realization of the capacity in potential value — the actual health change resulting from consumption. It is depicted as a downward-sloping curve that may become negative. Whatever the accuracy of Albert's figures, his example cuts to the heart of effectual value: outputs exist that could increase health, but under current social arrangements they fail to achieve this result. The conclusion is clear: the distribution of outputs is central to the ultimate health benefits that are derived from an economy’s outputs. An important distinction between potential and effectual value is that potential value is a relationship between an output and the human body — the output's capacity to modify the body's health. Effectual value, on the other hand, is the result of an activity — consumption. Thus an output possesses the attribute of potential value, but effectual value is achieved when the output is consumed by a human being. Although it is tempting to treat effectual value as an output’s attribute, this should be resisted to avoid logical errors. There are two key economic factors that account for the decline in an output's effectual value: satiation and output losses. 1. Michael Albert, The Trajectory of Change: Activist Strategies for Social Transformation (Cambridge, Mass. : South End Press, 2002), 31. In a similar vein, an amendment to a UK housing bill in 2004 proposed that homeowners should be forced to rent out properties that have stood empty for more than six months. The Labour backbencher who introduced the measure explained that, "…there is widespread support in the country for making best use of the existing homes before we get on building more homes." About 750,000 homes are standing empty in the UK at any one time. The plans would have covered 300,000 homes. ("Plans to force owners to rent out empty homes", Guardian website, May 11, 2004).